From the moment we wake up in the morning to the moment we climb into bed at night, visual images and communication technologies permeate our every activity. Images penetrate our daily lives, from the food packaging we eat, the posters and signage we see, to the print journals we read. Similarly, new technologies of communication are literally at our fingertips; cellular devices allow people to not only make phone calls, but also search the Internet and engage in online social networking. Jointly, images and technologies enable people to receive, interpret, and convey messages, making it even more essential that people are literate in all forms of communication. Literacy is not a new topic of conversation within the realm of education, or in art education specifically. For a long time, literacy referred to verbal and print-based communications. Visual literacy, while a relatively new term, has been discussed at length throughout a number of disciplines including art education, which exemplifies its interdisciplinary nature. New media literacy refers to current technological forms of information exchange, and intersects with visual literacy, enabling people to interact within and navigate an image-based world. This project explores multiple modes of literacy, including visual and new media literacy, and how they relate to art education. In carrying out this capstone project, I was interested in learning how new media literary relates to my own work teaching elementary art classes at a public school in Florida. I compiled my research into a literary review and constructed a series of tables that compared the skills of visual and new media literacy to the state and county standards in art. The result of this research led me on a path to develop a short video presentation of my reflections of my own art education practices and a series of handouts to present to art educators in the school district I work in, Polk County School District, as a way to generate professional conversations about our approach to teaching art to today’s students. 13 multimodal literacy should be included in the art curriculum, as it directly relates to how people communicate with one another. TETAC further states that documents, change in my personal teaching practice and change in the way Polk County art educators approach the art curriculum. I believe the most significant aspect of this capstone project is that it challenges the current vision and treatment of art education in my school district and sets the precedent for conversatio ns among my colleagues about bringing our curriculum into the 21 st century. Limitations of the Study Because multimodal literacy studies are relatively new, it has been difficult to find evidence regarding new literacy gaps and the impact these literacie s have on student engagement. Consequentially, it will be challenging to determine what other factors play a role in the development of new literacy skills beyond those found in the classroom or school setting, such as socioeconomic differences. My resea rch but the process of initiating change will take time, so for the purpose of this project only the first step which was to identify a need and propose change is d ocumented. If more time was allotted for such investigations I would be able to work with my fellow art teachers, engage in dialogue pertaining to their current art practices (surveys, polls, etc.) that would create a clearer argument for the need to dev elop a nd to implement these changes. 16 language, and object placement. In order to be visually li terate, Ausburn and Ausburn interpret (p. 291). Consider that even letters o f the alphabet and sign language utilize visual thinking in order for communication to work effectively. Although the term visual l iteracy was only developed a little more than 40 years ago, using pictorials and visuals to communicate is not new. Velde rs (cited in Peterson 2009 30,000 years ago, t he description of it only 2,500. visual literacy is 2,500 years old (as in infancy, we learn to recognize, categorize, and sort out all manner of objects, people, activities, and phenomena such as weather, colors, or moods (p. 6). Yenawine (2003) counter images in many media that go beyond simple representation and include documentary evidence of events, people, and places, ties of the art classroom serve as the fou ndation for developing visual literacy by exploring and investigating both fine art from museums and galleries to everyday media and imagery. Visual Culture To understand visual literacy, it is important to look at visual culture. For the purposes of this discussion, v isual culture refers more to items mass produced and consumed, rather than the fine art found in museum spaces. These items can include images that serve entertainment purposes such as television, magazines, and books. 19 photography, and vide, and therefore utilizing mult imodal literacy within the field of visual arts will create a more comprehensive instruction. Challenges What challenges are presented when implementing a multimodal literacy art curriculum? It is well documented that gaps in socioeconomics play a role the income children and English language learners have limited word knowledge, which negatively (p 1). Research indicates that students from less financially secure families are also less likely to be prepared for new literacies. According to data from Literacy Today (2010 ) : C hildren aged 8 15 in DE households (defined as those households where the chief income earner is either a semi skilled or unskilled manual worker) remained less likely than households with children in other socioeconomic groups to have access to digital te levision, DVRs and the Internet. (p. 20) Jenkins (2009) identifies a par ticipation g ap indicating that students in urban communities are more likely to have access to computers and wireless Internet access than in rural areas (p. 16). Naturally, those students who have access to technology and the Internet are more likely to be literate in new media than those who do not but merely having access to technology does not mean that students will be literate Surprisingly, in a study conducted by Pew Internet and American Life Project, urban youths were more likely than suburban and rural youths to be media savvy (Jenkins, p.
20 3). Perhaps this is because urban environments offer more wireless service. For instance, when I am in the downtown area of my hometown, it is easy to find wireless hotspots, where Internet access is avail able freely. In contrast, the more rural areas of town, where businesses are more scarce and empty land more prominent, it is quite difficult to find free access, if yo nternet at home it could prove challenging to find opportunities to browse online. In addition to potential gaps in visual and multimodal literacy development, there ies and postmodern theory invite visual culture in the classroom, leaving some teachers with feelings of confusion and support visual culture art education because they view it as a threat to the traditional discipl ines within fine art education. raised by visual culture may be painful for some art teachers to consider, it is worthwhile to rethink the legitimacy of the di vision between fine arts and other visual forms in of this new visual culture art education. Visual culture and visual literacy do not necessarily replace art education content that already exists, but create new learning objectives within art education for students to be able to make connections with their constantly changing environments. 23 broader range of art works from a variet y of sources on a global scale the potential for networking is limitless. 26 almost entirely on the development of art knowledge using the Visual Vocabulary and V isual Conventions, often overlooking the critical components, such as Verbo Visual Association and Reconstructing Meaning. Despite my dismay, I kept moving forward in my research, collecting information that related to multimodal literacy competencies, a nd found the 21 st Century Skills, presented by Henry Jenkins (2011). These are skills that address new media literacy within a participatory culture, one in which communication technologies are multimodal and interactive (Table 2 2). The first skill on t he list is Play, which reminded me of an article by Olivia Gude (2010) that talked extensively about play in art education and how it is an essential factor in developing creativity (p. 35). I wondered if I am allowing my my curriculum too rigid? Students need to play with an expanded selection of media and materials, including technology, s omething that I realized need s to be address ed in my classroom. 27 21 st Century Skills Play The capacity to e xperiment with one's su rroundings as a form of problem solving. Performance The ability to adopt alternative identities for the purpose of improvisation and discovery. Simulation The ability to interpret and construct dynamic models of real world proce sses. Appropriation The ability to meaningfully sample and remix media content. Multitasking The ability to scan one's environment and shift focus as needed to salient details. Distributed Cognition The ability to interact meaningfully with tools tha t expand mental capacities. Collective Intelligence The ability to pool knowledge and compare notes with others toward a common goal. Judgment The ability to evaluate the reliability and credibility of different information sources. Transmedia Navigat ion The ability to follow the flow of stories and information across multiple media. Networking The ability to search for, synthesize, and disseminate information. Negotiation The ability to travel across diverse communities, discerning and respecting multiple perspectives, and grasping and following alternative norms. Visualization The ability to translate information into visual models and understand the information visual models are communicating. Retrieved from http://www.newmedialiteracies.org/t he literacies.php Table 2 2 Another skill I noticed is n etworking something that our district visual arts coordinator constantly provides opportunities for us to do through professional development and art workshops. Networking in this list refers to the ability to search and collect information. Our district consists of the best resources, our fellow teachers. Although teachers communicate, through this research I believe that using new media could help us to network even more successfully with each ot her and also teachers globally. Also, if it is important for us as educators to network with each other, then and artists? 28 It was then that I decided to look closer a t how these skills and competencies are aligned with the Florida Next Generation Sunshine State Standards (NGSSS) and the Polk County Curriculum G uide. I downloaded the NGSSS standards for grade 5, and found that there were five distinct Big Ideas listed and then three Enduring Ideas for each Big Idea (Table 2 3). I discovered that the NGSSS are comparable to both the visual literacy competencies and new media literacy 21 st century skills An example of this is in the statement, The 21 st century skills necessary for success as citizens, workers, and leaders in a global economy are embedded in the study of the arts last statement appears to be a significant element in my argument for curricular change within my district. 35 considering the integration of multimodal literacy in my curri culum. Therefore, I decided that in addition to a video, I would need to develop a PDF handout that outlines the information that I have compiled (Appendix B ). Eventually, this handout progressed into a proposal for professional development. The first p age is a cover letter addressed to the Visual Arts District Coordinator for Polk County, outlining the purpose of the preceding documents The second page brings attention to the research findings, explaining how our District goals compare to visual and n ew media literacy as well as Florida visual arts standards. The third page shares the objectives for multimodal literacy that I developed for the art classroom and some suggestions for activity starters Next I created a two page handout with links to a variety of online tools that will make implementing new media in the art classroom easier. I included links to social media sites, video and photo sharing, and to other art teacher websites just to name a few. The final document provides educators with s ome suggestions for how to proceed with multimodal literacy in the art curriculum, including the development of a committee of art educators to asses and modi fy the current art objectives. The goal of this packet is for it to be used as a tool by teachers collaboratively, for creating changes in how we develop the future of our visual arts program. 3 7 objective states students will use a variety of visual vocabulary and cognitive processes in order to critique and form aesthetic judgments about a variety of art and visual images, including their own wor k I utilized the vocabulary pertaining to visual and new media literacy, since they were the two key subjects I was researching. Often though, I xpressing key ideas, and fell to the trapping of limiting myself to only what was in the text For my classroom I need to make sure that I remind students that vocabulary is important, but that they can explore and create their own meanings as well. The art and images throughout history to learn, understand, and make connections within refers to the art history and culture components which I was able to make connections t o what I was researching and how it related to my students The last object ive states s tudents will be able to access and use effectively the skills necessary to interact and communicate through art, use new communication technology, and take risks in th e creative process in order to participate in the 21 st century Consequentially, I realized that by taking risks, I was able to see what I was capable of creating and the same goes for my students and fellow educators. I believed that I was multimodally literate, but found that I too have room to grow with the construction messages through art and media. Future Direction for My Colleagues I believe that my coworkers have the heart and the drive to make art education the best it can be I know this beca use of the number of professional development opportunities we partake in, the countless art shows and the many communications we have through email. 39 dev elopment of students who are capable of participating in 21 st century global community. Future Direction for Myself First things first, I have to admit that I need improvement, which I do. I need to embrace my insecurities with new media technology, lea rn to play more, and not shy away from making mistakes. This project is the culmination of two years of intensive research and study in the field of art education, and in my own beliefs and practices. I have a collected a wealth of knowledge that I want to share with my peers and with my students. My new objectives for my own work include: Ut i lizing the three computers I have in my classroom to create a media hub where students are using multimodal literacy skills to resear ch and create art. Moreover, I will reevaluate my lessons to ensure that they multimodal literacy skills, which include visual culture and new media. I need to work with my colleagues to ensure that art education remains relevant in this visual and participatory cul ture. It is imperative that I become more vocal in my communication with students, administrators, and parents about the applied benefits of art education (ones that go beyond vocabulary development) in order to build a community of student artists who em brace big ideas and new media, and understand and exploit the power of their individual and collective voices. 47 REFERENCES Arnheim, R. (1974). Art and visual perception: a psychology of the creative eye Berkeley, CA: University of California Press. Ausburn, L. and Ausburn, F. (1978). Visual literacy: background, theory and practice. Programmed Learning & Educational Technology 15(4), p. 291 297. Avgerinou, M. (200 9). Re TechTrends 53(2), p. 28 34. Avgerinou, M. (N.D.) International Visual Literacy Association Retrieved from ht tp://www.ivla.org/org_what_vis_lit.htm Carpenter II, B. & Cifuentes, L. (2011). Visual culture and literacy online: image galleries as sites of learning. Art Education 64(4), p. 33 40. Chauvin, B.A. (2003). Visual or media literacy? Journal of Visua l Literacy, 23(2), p. 119 128. Literacy Today. Retrieved from www.ofcom.org.uk/advice/media_literacy /medlitpub/medlitpubrss/ukchildrensml/u kchildrensml1.pdf Gardner, Howard. (2008). The 25 th Frames of Mind: The Theory of Multiple Intelligences. Retrieved from http://www.howardgardner.com/Papers/papers.html Gude, O. (2004). Postmodern principles: In search of a 21 st century art education. Art Education 57(1), p. 6 14. Gude, O. (2010). Playing, creativity, possibility. Art Edu cation, 63(2), p. 31 37. Hassett, D. & Curwood, J. (2009). Theories and practices of multimodal education: the instructional dynamics of picture books and primary classrooms. The Reading Teacher 63 (4), p. 270 282. Heise, D. (2004). Is visual culture be coming our canon of art? Art Education, 57 (5), p. 41 46. Jenkins, H. (2009). Confronting the challenges of participatory culture Cambridge, MA: The MIT Press. Jenkins, H. (2011). Project New Media Literacies Retrieved from http://www.newmed ialiteracies.org/ Kress, G. and Jewitt, C. (2008). Introduction. 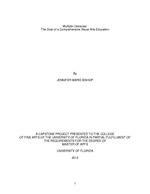 Jewitt, C. and Kress, G. (Eds. ), Multimodal literacy (pp. 1 18). New York, NY: Peter Lang Publishing, Inc.
48 Krug, D. & Cohen Evron, N. (2000). Curriculum integration positions and pract ices in art education. Studies in Art Education, 43 (3), p. 258 275. Pettersson, R. (2009). Visual literacy and message design. TechTrends. 53(2), p. 38 40. Richards, A. (2003). Arts and academic achievement in reading: functions and implications. Art Education, 56 (6), p. 19 23. Stewart, M.G. & Walker, S.R. (2005). Rethinking the curriculum in art. Art Education in Practice. Worcester, Mass: Davis Publications, Inc. Towell, J. & Smilan, C. (2009). Teaching literacy through the visual arts in a mul ticultural world. Journal of Reading Education. 35(1), 12 20. The Next Generation Sunshine State Standards. (2012). Retrieved from http://www.floridastandards.org/Standards /FLStandardSearch.aspx Ulbricht, J. (1998). Interdisciplinary art education reconsidered. Art Education, 51(4), 13 17. Visual Arts Curriculum Maps. (2011). Retrieved from http://publish.le arningfocused.com/1173391 White, C.E., Kim, J.S. (2009). Putting the pieces together. Center for American Progress. Retrieved from WWW.AMERICANPROGRESS.ORG Yenawine, P. (2003). Jump starting visual lite racy: thoughts on image selection. Art Education 56(1), p. 6 12. Yujie, J. (2007). Dr. M. Erickson (Ed.). Teaching visual culture in the 21 st Translations. The National Art Education Association. 16(2), p. 1 5. 49 BIOGRAPHICAL SKETCH Jennifer Marie Bishop is an art educator and artist who currently resides in Lakeland, FL. Mrs. Bishop was born in Lakeland in 1982 and has lived in central summer her grandparents would pick her and her twin brother up from school the last day and travel a region of the United States, learning about the history and culture of each place, opting for national and state parks rather than typical amusement parks packed wit h tourist trappings. In high school, Mrs. Bishop had the opportunity to attend a European trip with her chorus group. The group spent 10 days traveling through Western Europe, with stops in London, Paris, and Heidelberg. In between performances, the group would visit castles, historic landmarks, and the highlight was of course, a trip to the famed Louvre in Paris. After high school, Mrs. Bishop enrolled in college at Florida Southern College, and pursued two degrees, Art Education and Studio Art, gr aduating in the spring of 2006. Immediately following graduation, Bishop was hired as an art teacher in a local elementary school. 5 years later, Bishop decided to reenroll in school, applying for her Florida. In the meantime, Mrs. Bishop was awarded the prestigious honor of being named Teacher of the Year by her colleagues for their school, Dr. N. E. Roberts Elementary.